With nearly 40 million Americans filing their taxes this week, many are likely wondering: How much does the government need my money, anyway? The federal government took in $3.3 trillion in tax revenue last year. More than 80 percent — $2.7 trillion — came from individuals through either income tax or payroll taxes that fund Social Security and Medicare. Corporate taxes kick in just 9 percent of the government’s revenue. After the recent tax cuts, the share from Corporate America will go down even more. The Office of Management and Budget projects corporate income taxes will drop to just 5 percent of government revenue in five years. Estate taxes make up even less. Last year, less than 1 percent of the government’s funding came from taxes on large inheritances (or, as the IRS calls it, taxes “on your right to transfer property at your death“). Now that the Tax Cut and Jobs Act has made more estates exempt, that tax will also be even less of a money-raiser. More than three-quarters of the federal government’s income last year came from individuals. The largest single source was the federal income tax; the second-largest was the payroll tax. Business taxes, excise taxes and estate and gift taxes made up the rest. A relatively small population makes up the country’s tax base: More than half of government revenue comes from just the top 5 percent of income earners. Some 76 million Americans have no federal income tax liability, according to the Tax Policy Center. That means they either earn too little to pay income tax or qualify for tax credits that cancel out their income tax payments. The bottom half of earners together contributes just 3 percent of the total income tax revenue, according to a Tax Foundation analysis. In economic terms, this is a progressive tax: Higher earners are taxed proportionately more. Many other taxes, like sales taxes, are regressive, meaning they cost poorer people more as a percentage of their income. Sales taxes are imposed by states, but the federal government has a version called excise taxes, which it levies on alcohol, cigarettes and gasoline. Excise taxes have fallen in importance in recent years, and today make up just 3 percent of government revenue. 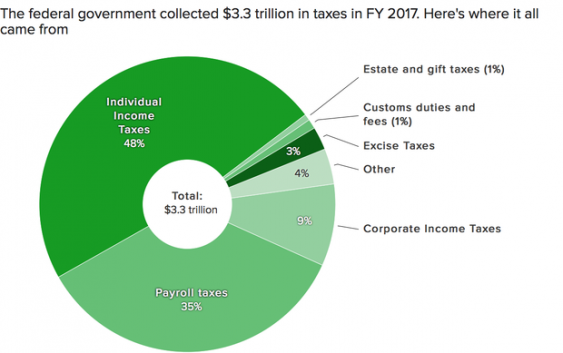 With $3.3 trillion moving from individuals into the Treasury last year, it may surprise taxpayers to hear that the IRS, by its own estimates, isn’t collecting all the tax it can. The agency calculated the so-called tax gap two years ago, and it found that it collects about 82 percent of the tax that is actually owed. Americans who fail to file taxes, don’t report income to the government or report less than they earned cost Uncle Sam $406 billion in 2010, the most recent year for which detailed analysis is available.